Amanda, a Realtor with Berkshire Hathaway Home Services Florida Network Realty, launched her Real Estate brand, “Closing Deals in Heels” in September of 2017. This new branding kick started a phenomenal year where Amanda closed more than $5 million in sales and sold 23 homes, representing both buyers and sellers. Amanda was recognized by Berkshire Hathaway in both July and August of 2018 for having the most transactions in her office. Prior to joining Berkshire Hathaway, Amanda worked for Marsh Landing Country Club Realty, on the Childers Real Estate Team, where she helped the team close $6 million in sales in her first year. Amanda has experience working with all types of properties ranging from foreclosures and investment properties to multi-million-dollar homes and new construction. She also enjoys working with a wide range of clients from first time home buyers and retirees to veterans and people moving to Jacksonville from out of state. One of her favorite things about real estate is educating her clients and making sure they feel knowledgeable and empowered from start to finish. She knows that knowledge is power and wants her clients to feel confident every step of the way. One of her education tools is through social media where Amanda conducts live Facebook real estate market updates and hosts discussions with local lenders, home inspectors, home insurance experts, and even home staging entrepreneurs. Her newest way of helping prospective home buyers be aware of what’s hot on the market, is to choose a weekly “Parker’s Pick of the Week”, which features a home tour that she and her newborn baby girl introduce to all interested buyers. Click Here to check out some of these videos for yourself! She also enjoys promoting her brand “Closing Deals in Heels” and hashtag #followtheheels which revolve around a hot pink heel that she takes with her everywhere. This brand combines real estate and partnering with locally owned women stores to promote shopping local. Throughout the year she partners with different locally owned store to feature monthly discounts to the store and to hold sip and shop events. Click Here to see who Amanda is currently partnering with! 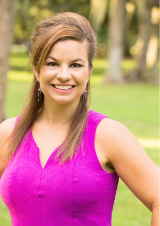 Residing in Jacksonville since 2009, Amanda brings with her a wealth of knowledge of the greater Jacksonville area. In her previous job with the United States Tennis Association, Amanda had the opportunity to work closely with more than 30 country clubs in Duval, St. Johns, Nassau, and Clay County, giving her an excellent background on real estate and housing in these niche communities. Amanda also spent four years working for the Wounded Warrior Project, planning Soldier Ride, a 5-day adaptive cycling event for wounded warriors that uses cycling and the bonds of service for warriors to overcome physical, mental, and emotional wounds incurred post 9/11. Amanda has used her experience working with veterans to help local veterans sell or buy their next home. She recognizes the sacrifices they have made for our country and wants them to experience the best customer service possible. Amanda, a native of Lakeville, Pennsylvania, grew up playing competitive tennis. She graduated from the College of Charleston where she played on a full athletic tennis scholarship. Amanda tributes her many hours spent on the tennis court to her personality traits that have given her success in life. Hard work, motivation, drive to succeed, self-discipline, positive attitude, and good sportsmanship are all things she learned on the court and can now be applied to her professional career. The City of Jacksonville noticed this work ethic in Amanda when in 2011 she was honored by Jacksonville’s, Buzz Magazine, as one of the “Top 30 Under 30 – Future Leaders of America” and in 2010 was honored by the Cystic Fibrosis Foundation at “Jacksonville’s Finest”, an event that honors young business professionals who have helped make a difference in the fight to cure cystic fibrosis. Amanda also previously served on the board of IMPACTjax, the Chamber of Commerce’s Young Professional Organization, and is still involved with the organization. Amanda, a new Mom, has less free time than previously, but when she’s not caring for her baby girl, she teaches spin and group fitness classes, takes her puppy to the dog park, plays tennis and golf, and volunteers at her church. When considering buying or selling a home, Amanda can be reached by phone, text (570.470.6156), email (creechrealtor@gmail.com), or social media (faceboook, Instagram).